At KNUST JSS, where I had my basic education, we were taught not only to keep the school compound clean but also to maintain a clean environment wherever we found ourselves. There were sign boards on the school compound bearing messages on cleanliness. Dustbins were branded with such messages. There were posters in classrooms bearing these messages as well. We had a kind of honour code -- if you saw a colleague litter, you’d say, ‘Shame, pick it up’. The culprit, out of shame and embarrassment, would do the proper thing. It may sound ineffective on the surface but it worked. The recalcitrant students were made to face the music. We had compound prefects who ensured such students were brought to book. This was a school with about 1000 students back in 2005 when I completed. We were that many. Basic 7 (form 1) classes alone numbered from 'A' all the way to 'M'. So you can imagine being called at morning assembly and given some lashes for littering, in front of the whole school. It was such a shame and no one wanted to subject to that treatment. Because of our numbers, students were very competitive. We competed at almost everything -- quizzes, debates, sporting activities, etc. We were divided into 8 sections. These sections were named after vice chancellors of KNUST. The sections were allocated plots on the school compound to clean every day before morning assembly. Teachers placed on weekly duty would then go round and award marks on how well these plots had been cleaned or kept. The section with the cleanest plot at the end of each week won. This sanitation competition was also conducted amongst our various classes. Every class had a cute flower garden up front. At the end of every week, the classes with the tidiest classrooms and best-kept gardens were awarded. As children then, we saw those competitions and rules on keeping the environment clean as just part of the school's programme. Little did we know that our well-meaning teachers were impressing on us a cleanliness culture we would live by for the rest of our lives. To this day, even if I consumed something as little as a toffee and there were no proper means of disposal nearby, I would keep the toffee wrapper in my pocket or bag until I eventually found a proper means of disposal. That’s my attitude. The sanitation problems in Ghana can be solved with attitudinal change. The campaign and fight against filth in Ghana must begin with the mind. It is estimated that more than 20,000 tonnes of waste is generated in the country daily. Accra alone generates 3,000 tonnes. We all know the effects of poor sanitation. We are living testimonies of the cholera outbreak that claimed lives in this country a few years back. We have so many laws on sanitation at the national, district and regional levels but our neighborhoods, towns and cities are engulfed in filth. If we want to succeed at making our cities and towns clean just as our counterparts in Rwanda have done, we must change our attitudes to complement these laws. We must train our children not to litter. We must have the decency not to litter. If you’re driving or riding in a cab or Uber or 'trotro', don’t throw rubbish out of the window. Don’t sweep your compound and dump the refuse in the nearest gutter. Dispose of waste properly, dustbins or no dustbins. Cogito ergo sum is a Latin philosophical proposition by René Descartes usually translated into English as "I think, therefore I am". Poor sanitation in Ghana is a reflection of how we think as a people. Think before you litter. 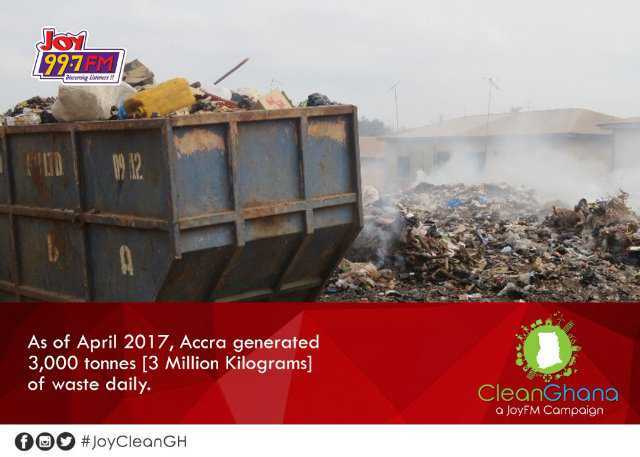 My name is Nick Opoku and I fully endorse the Joy fm Clean Ghana campaign.